Action packed for the guys, cute and cuddly for the ladies. It is the game thats going to get you laid. Just pop it on your iPad or iPod and she'll squee for hours. You play as a kid who prior to his capture by the stuffed animals abused toys and did unmentionable things to their stuffings. They have kidnapped you and put you in their gladiatorial arenas. How long can you survive? Wave based never ending action with weapons such as the Syrup Shotgun and the Marshmallow Machine Gun, the non-stop action will leave you wet and sticky. Being made with Epic's Unreal Development Kit. Hello homedawgs and homeskillets! Team Forecourse, founded by Michael Allar, is creating a mobile game entitled StuffIt using the Unreal Development Kit. 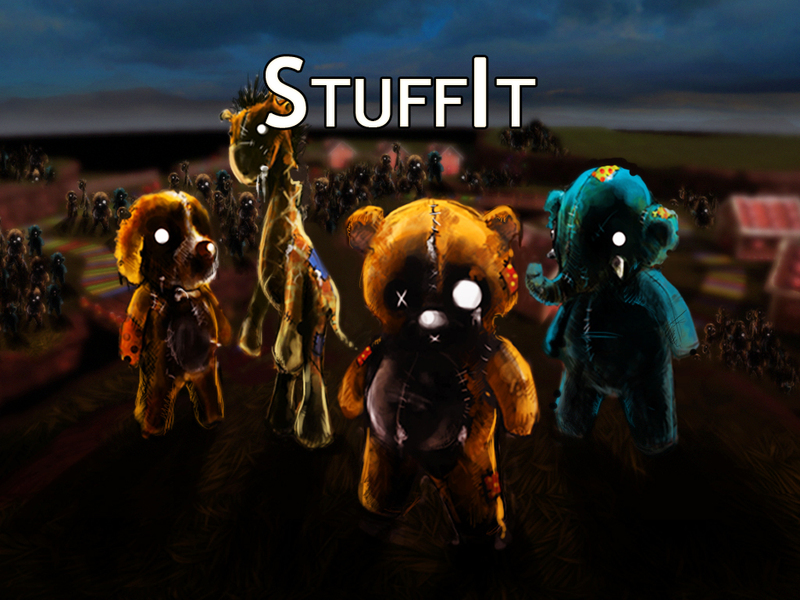 StuffIt is a third-person horde wave shooter aimed for mobile devices. 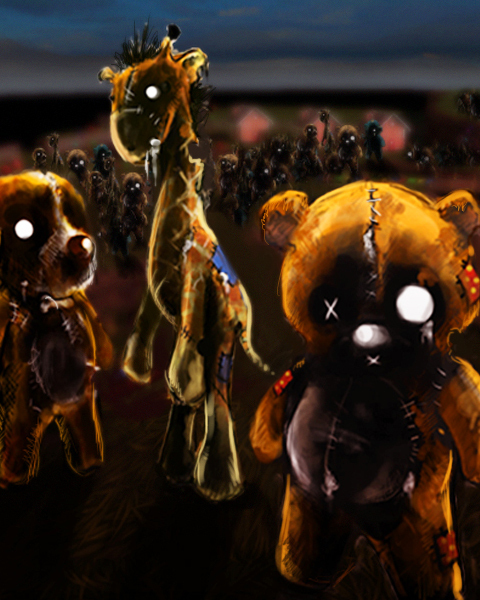 You play as a kid who used to abuse stuffed animals by ripping them apart and doing unmentionable things to their stuffings and now the stuffed animals have kidnapped you for revenge. As we all know, the only way for stuffed animals to get revenge is through gladiatorial arena wave based combat. There are two arenas to choose from, one being nice and happy Candytown and the other being grim and hellish Deathville. 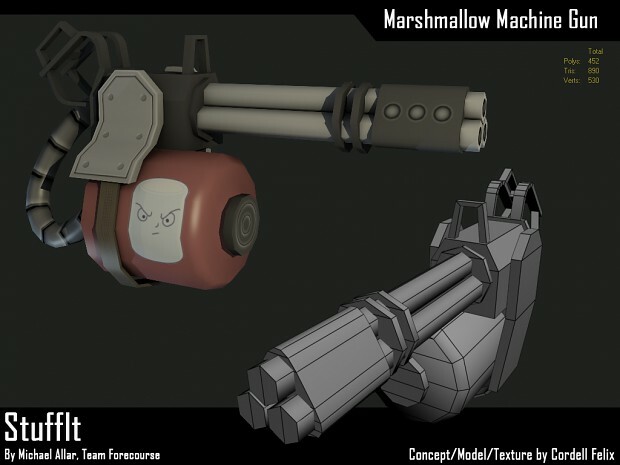 To fight off these hordes and boss creatures of stuffed animals, there are five weapons at your disposal including the Marshmallow Machine Gun. During the development of this upcoming game, our character rigger Adrian Rodriguez (Icanrigit.com) created physics assets for our characters which allowed them to be rag dolled around. Upon his discovery of being able to play with rag dolls in the Unreal Development Kit's PHaT tool (with which physics assets are created) production for the entire team stopped as we merged his packages into the development build just to fling our stuffed animals around. We decided that creating a free small little mobile app that all you do is spawn and fling animals around would be somewhat entertaining, shameless free advertising, and most importantly very educational in terms of learning how to go from Epic's UDK to an app on the Apple app store. The process in which this happens is riddled with pitfalls and gotcha's, even more so than what we were expecting. It only took one day to code and put together everything needed to create the free app StuffIt: Playroom with rag dolls, however it has taken almost two weeks to get it packaged, sent to apple, reviewed, rejected for very odd reasons, fix, appeal, review, rejected due to an issue with the app packager, fix, review, and finally get accepted. In any case, heres a small little video taken from my webcam since I can't afford an actual camera of StuffIt: Playroom in action. Also, if you are interested, heres a video explaining why and how we decided to push out StuffIt: Playroom. I didn't realize that I should of been looking directly at my webcam until afterwards, but this isn't about me or my beard, its about StuffIt :D.
Also if you don't have an iOS device, we have a pc port available for download which you can easily spawn a ridiculous amount of rag dolls with dynamic lighting without many performance issues. Stay tuned for more updates regarding StuffIt and StuffIt: Playroom! Sounds pretty interesting, keep it up! PC version of our mini-game StuffIt: Playroom released. Check out our downloads tab! Please rate us well, could use all the support to make StuffIt awesome and to get you laid! Sounds like this is a positively foolproof way to get laid! I guess we can't convince you to make a PC version as well? Our aim is for mobile, and because of the nature of mobile we can cheat at a few things (shhhh don't tell anyone). If testing on PC also gets us laid we'll consider releasing for PC as well.